The Cash Balance Plan is a retirement plan designed to primarily benefit older and/or highly compensated business owners and highly valued employees. Unlike a traditional 401k or IRA plans that limit one’s tax-deferred contributions to relatively small amounts, the Cash Balance Plan provides the ability to contribute significant amounts of tax-deferred income to turbo-boost retirement savings. All basic retirement plans (401k, IRA, SEP, etc.) will generally fall into one of two categories; defined contributions or defined benefits. The words used to describe these two categories also describe how they are funded. A “Defined Contribution” plan can only contribute a defined amount of money. For example, as of this writing in January 2017 the amount of money that can be contributed to an IRA is $18,000/year for an employee under 50 years old. Employees older than 50 can contribute an additional $6,000/year for a total of $24,000. Again, the essential element and limitation to these types of plans is that the amount of the contributions are defined/limited to a specific dollar amount. The other major category of retirement plans is referred to as a “Defined Benefit” plan. The traditional defined benefit plan is often referred to as a “pension”. A pension is generally a guaranteed payment made to a retiree based on a number of variables like; years of service, income and the age at retirement. What is key to understand is that it is the benefit that is defined, not the amount of money that can be contributed. Therefore, someone who is older and closer to retirement will have less years to contribute and invest. Therefore, to provide the same benefit at retirement someone who is older would have to contribute more money (and receive a bigger tax deduction) than a younger employee. While the concept of making larger contributions to one’s retirement plans is attractive to those with higher incomes who face high income tax rates, unfortunately, traditional defined benefit plans/pensions came will limited flexibility. 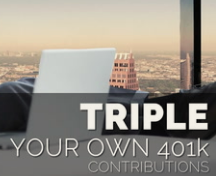 When compared to a 401k plan, where one could contribute the maximum amount one year and then nothing the following year (providing maximum flexibility), traditional defined benefit plans to not afford that flexibility As a result, to provide a guaranteed benefit at retirement one generally had to make a contribution every year to the defined benefit plan. This can be problematic for the entrepreneur, especially if that entrepreneur’s income fluctuates from year to year. The other issue for the business owner was that, at retirement, the defined benefit plan only provided a guaranteed income stream, whereas a 401k/defined contribution plan provided a lump-sum of cash if desired. Again, the defined contribution plans provided more flexibility than the defined benefit plan. Then, in 2003, Congress enacted a law to address both these issues and created the “Cash Balance Plan“. The Cash Balance plan provides flexibility with the contributions as well as flexibility with the distributions. In other words, it allows the contributor the ability to make smaller or larger contributions while working and then to receive the distributions at retirement in a lump-sum or as an income stream at retirement. Often, with flexibility comes complexity and the Cash Balance Plan is no exception. That said, for those earning significant income, the ability to defer a significant amount of that income and, subsequently reduce the taxes dues on those deferred earning to easily justify that issue. For more information about Cash Balance Retirement Plans or any questions you may have about retirement planning, asset protection, estate planning or tax planning please email us at Info@LifetimeParadigm.com and/or please, leave your comment below.